When the Kurukshetra battle was over, Lord Krsna bade farewell to the Pandavas and went to Dwaraka. While on his way he met his old brahmana friend Utanga. 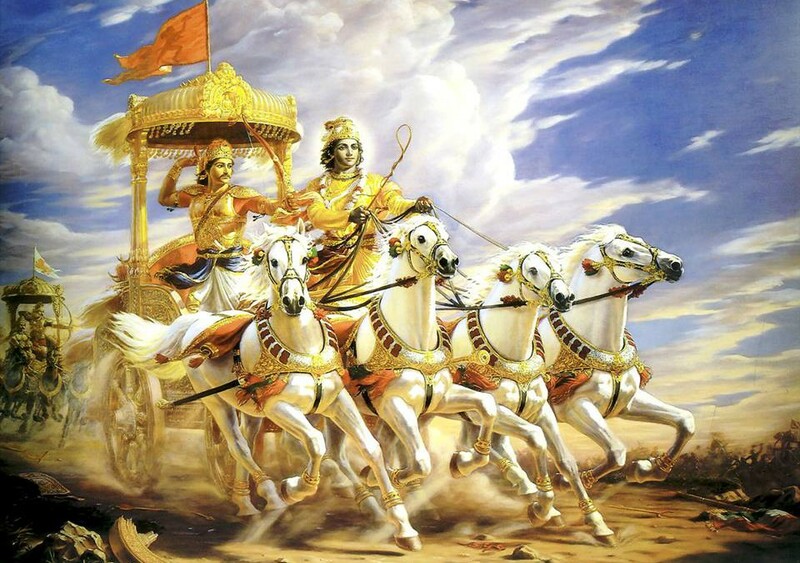 Krsna stopped and descended from his chariot and saluted the brahmana. Utanga returned the greeting and proceeded to make the usual enquries about the health and welfare of relatives. He asked whether Krsnas cousins the Pandavas and Kauravas love one another as brothers should and whether they are well and flourishing. The innocent brahmana had not heard about the great battle that had been fought. The Lord was astounded by this question and for a while he stood silent not knowing what to say in reply. He then softly disclosed what had happened, about how a great battle had been fought and almost all the Kauravas had been exterminated. On hearing the narrative Utanga became very angry. He told Krsna that He had failed in His duties and asked Him to be prepared to receive his curse. In reply the Lord just smiled asking him not to use up the fruits of his great penances. He then proceeded to show Utanga his Visvarupa form and explain to him the message of the Bhagavad Gita just as He had done to Arjuna. After this explanation of Krsna, Utanga recovered his calm and the Lord was pleased. He told the brahmana to ask for any boon he desired to which the brahmana said that he did not desire anything as he had seen the the Lord Krishnas Universal form. When Krsna insisted, Utanga said that he should be able to find water whenever he might feel thirsty. The Lord thus blessed him and went on His way. Later when Utanga was passing through a desert he felt very thirsty and remembered the the boon he had received. He decided to make use of that boon. The same moment, a nishada(SHUDRA) appeared before him clothed in rags; he had five hunting hounds(dogs) in leash and a water bag strapped to his shoulder. He offered the bamboo spout of his water skin to the brahmana to drink from. Utanga looked at the man in disgust and told him he was not thirsty and asked him to go. Saying this he reproached the Lord in his mind for the kind of boon He had given him. The outcaste pressed Utanga over and over again to quench his thirst, but it only made Utanga more and more angry and he refused to drink. Seeing this strange disappearance of the nishada the brahmana reflected, Who was this? He could not have been a real nishada. It was certainly a test and I blundered miserably. I rejected the water offered by the outcaste and proved myself to be an arrogant fool. Utanga was in great anguish when a moment later Madhava Himself appeared before him with conch and discus. O Purushottama! exclaimed Utanga,Was it right of You to send an outcaste offer unclean water to a brahmana like me ? Was this kind?asked Utanga. He spoke in bitter tones. To him the Lord replied smiling, O Utanga! for your sake I asked Indra to take amrita and give it to you as water. He said he would on no account give nectar to a mortal. But I prevailed upon him and he agreed to do so only if I allowed him to test you in the form of a chandala. I accepted the challenge believing you had attained that stage of understanding. But you have and made me suffer defeat at Indras hands. Although the Brahmana asked the Lord only for water, the Lord gave him nectar out of His causeless mercy. The Lord always cares for us more than we do for ourselves. We just need to have the vision to understand His mercy.